Arkansas farmers planted 445,000 acres of cotton in 2017, up from 380,000 in 2016. 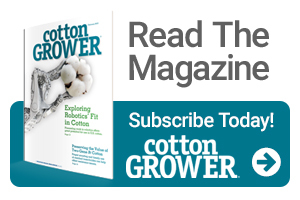 Cotton acres have been in slow decline since 2000, with the exception of 2006, when growers planted 1.17 million acres. Of the 33 operating gins in 2017, 23 of them ginned 20,000 bales or more. In 2016, only 17 gins handled the same volumes. However, low cottonseed prices may put the brakes on growth, Stiles said. 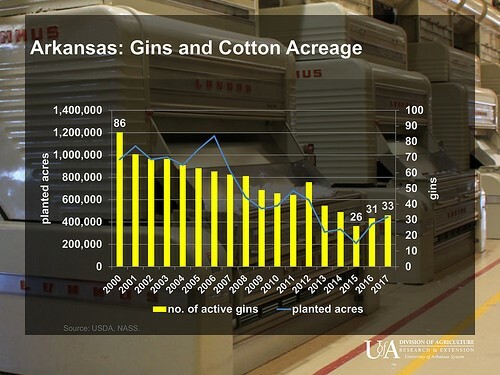 “We may find in 2018 that even increasing cotton acreage may not be enough to sustain gin numbers in the state,” he said. Cottonseed prices spiked in June 2014 at $460 a ton and sank to $130 per ton in November 2017. Mary Hightower is a communications specialist with the University of Arkansas System Division of Agriculture. See all author stories here.